Take every piece of advice with a grain of salt. Before continuing with my guide on buying a camera, I would like to point out that I used to sell cameras at a big-box electronic retailer for a living. That doesn't mean what I, or the salesman at the store, says is 100% objective. For example: a camera may fit nicely into the palm of my hands, but maybe you have bigger hands than I do. Although online vendors tend to offer slightly better prices, I would recommend purchasing cameras from a store that you can walk into. Take advantage of their return policy and remember that your own preferences are more important than the words you are about to read. "I want to take better pictures. What's a good camera to buy?" That is one of the most common questions that a former salesman/now photographer, like myself, is posed with. Let's look at all of the deciding factors in buying a camera. Before going deep into detail, here are some frequently updated buying guides from reputable photography websites. Have no fear - I generally agree with most of their picks. None of these guides outline, in detail, what a buyer should look for when hunting for a camera. That is why I am doing just that. If you don't feel like reading, here are my top three picks in a nutshell. Even though a camera boasts a high megapixel count, it doesn't necessarily mean you will get sharper/clearer pictures. In many situations, the opposite is true. Think of the time when you were in a small, crowded elevator and thought, for the first time in your life, you were clastrophobic. Without getting technical, manufacturers are doing just that: cramming more pixels into a tiny camera. The result is a "noisier" picture (click on the Fairfield University mug to the right to see digital noise at ISO 800). Noise exists in every digital picture you see, but are more apparent when you enlarge pictures to poster size (11x14 and up) and especially at higher ISO sensitivity settings. More on ISO sensitivity later! The plus side to having more megapixels is that you have more flexibility to blow pictures up into larger poster-size. Pictures are less pixelated (in other words, it's less "blocky" and looks clearer) when you have more pixels to work with. This shot, taken in my own living room without the flash flash, was then downloaded straight out of my camera and was not re-touched. It's extremely grainy (similar to the old-school grain in film photographs) - except this type of grain is ugly. How important are the megapixels in a camera? Examine your own habits: how often are you *really* going to enlarge pictures? You won't notice a difference in sharpness or noise when you view them at a reduced size on the computer, or on a printed 4x6. In a nutshell: Megapixels, to me, are a moot point unless you enlarge pictures beyond 8x10. As of October 2007, I am more than content with my 6 megapixel pocket camera. This one may seem pretty obvious. The larger the zoom, the closer you get with a picture. Buyers be weary of the misleading "digital" zoom. Digital zoom is essentially the camera electronically magnifying a shot. Sounds cool, right? What's the catch? Digital zooming is the SAME thing as magnifying and cropping a picture on a computer. If you "magnify" the picture within the camera, you lose the un-zoomed part of the image. Whereas if you shot the un-zoomed photograph and later cropped it on a PC, you now have the flexibility of keeping the original OR keeping the cropped version. Magnified shots are also less sharp and a bit more noisy (as you are essentially enlarging a portion of the image). Optical zoom is the good one of the two brothers. This is where the camera is physically moving the glass closer to your subject without compromising most of the image quality. Larger zoom cameras tend to be big. 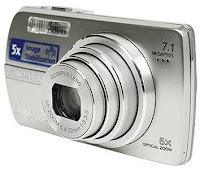 You won't find large optical zoom cameras in a credit card style camera. A close match: While maintaining awesome picture quality, one of Panasonic's known gems is the Lumix TZ3; a small'ish camera with a large 10x zoom! "Credit card size" cameras pack less features (such as a lack of Aperture, Shutter, or Manual modes gives you more control over the pictures you take). If you are looking for a party camera, slim ones are created specifically for you. They tend to have large LCD screens, a thousand different scene modes (e.g. Beach, Snow, etc.) and offer an overall no-frills experience. One example is the Olympus Stylus 750. With 7.1mp, 5x optical zoom, a small exterior, and its not-so-hefty price tag of $250 (as of October 2007), you can't go wrong ... unless you want something more than a "fun" camera. A reputable review for the Stylus 750 by DCResource.com states that the camera has "softness around edges of frame; fuzzy details." Such image quality issues are common with slim cameras. Then how does one judge image quality? Manual Mode (where the photographer can adjust all of the aforementioned variables). To keep it simple: cameras that allow for these adjustable values have a higher image quality as those who know how to manipulate them, will also be able to recognize good image quality vs. bad image quality. Intimidated? Explaining what each of the variables do is an article on its own! Luckily, all of the cameras that have the adjustable values still possess an "Auto" mode. The same goes with Scene Modes (such as Beach, Snow, etc.). Auto and Scene Modes simply know when to pick a correct combination of the aforementioned settings - but not all of the time. A camera is sometimes too unintelligent to choose the right settings. That is why advanced photographers usually want the ability to adjust the White Balance, or the Aperture, etc. depending on the moment. This feature is quite useful when the photographer opts to disable the flash. Under poor lighting conditions and without the aid of flash, pictures are more prone to being blurred. Image Stabilization doesn't work miracles (especially when there is very little light available) but it does help to a certain degree. 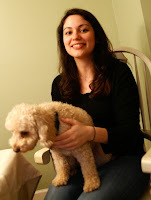 Look at this picture of my friend Michelle and her puppy, Rocky, taken under a normal kitchen fluorescent light. If you look closely, it's already a bit blurry. "IS" saved the picture from being completely blurry. For coffee drinkers like myself, our hands can be pretty shaky. It won't shake as much as for someone who, unfortunately, has arthritis. But the hands of someone amped up on caffeine does shake *just enough* that it can blur a perfectly good picture. In many cases, IS does a good job of compensating for this faux-condition. Cameras eat battery power like candy. That's why I love cameras that can take Double AA's. If your camera's battery runs out of juice while you are on the road, you can just stop into any convenience store and buy Double AA batteries! On an environmentally friendly level, they sell rechargable Double-AA batteries. The 1-Hour charger and 4 batteries cost about $20-$30. One investment in this puppy will prevent you from having to buy AA's every single time your camera runs out of juice. - What if you lose your charger? - What if you lose the battery? 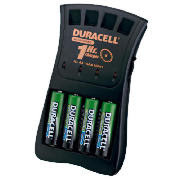 - Where do you effortlessly buy extra non-AA batteries? I'd recommend the Duracell 1-Hour Charger, though they do make 15-minute chargers. If you are the procrastinating type that waits until the last minute, get the 15-minute version. As of October 2007, here are my own top picks for small cameras broken down into general categories. It lacks many of the manual features (such as Aperture or Shutter). But it does a damn good job of staying small and taking good party pictures - especially if you do not know how Aperture, Shutter, White Balance, and ISO values work. It doesn't take AA batteries so you will have to order do a little detective work on where you can buy a genuine or generic spare. I have the older A540 and I love it. The A570 is its successor as it maintains the awesome image quality when compared to other non-professional cameras. There are a lot of customizable features (such as Color Vividness), along with the advanced manual settings (Shutter, etc.). From everything that I have read, this camera is amazing! It's definitely not something you can even try to put into your pocket. But you get a huge 18x optical zoom, image stabilization, manual controls, a huge LCD, and it takes double AA batteries! I am the sort of hombre who loves to try bran-new things. Currently I'm making my own pv panels. I'm managing it all by myself without the assistance of my staff. I'm utilizing the internet as the only path to acheive that. I encountered a truly brilliant site which explains how to create solar panels and so on. The website explains all the steps needed for pv panel contruction. I am not sure about how correct the information given there is. If some people over here who had experience with these works can have a peak and give your feedback in the site it will be great and I would highly appreciate it, because I really passion [URL=http://solar-panel-construction.com]solar panel construction[/URL]. Thanks for reading this. You people are great.